Cross River is a state in South Nigeria, bordering Cameroon to the east. Its capital is Calabar, and its name is derived from the Cross River (Oyono), which passes through the state. English, French, Bekwarra, Ejagham and Efik are major languages of this state. Cross River State derives its name from the Cross River which passes through the state. It is a coastal state located in the Niger Delta region, and occupies 20,156 square kilometers. It shares boundaries with Benue State to the north, Ebonyi and Abia States to the west, to the east by Cameroon Republic and to the south by Akwa-Ibom and the Atlantic Ocean. The South-South State was created on 27 May 1967 from the former Eastern Region, Nigeria by the General Yakubu Gowon regime. Its name was changed to Cross River State in the 1976 state creation exercise by the then General Murtala Mohammed regime from South Eastern State. :222 The present day Akwa Ibom State was excised from it in the state creation exercise of September 1987 by the then regime of General Ibrahim Babangida. Its capital is Calabar. 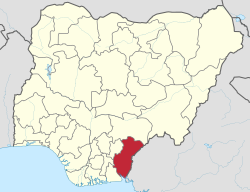 Its major towns are Akamkpa, Biase, Calabar South, Ikom, Igede, Obubra, Odukpani, Ogoja, Bekwarra, Ugep, Obudu, Obanliku, Akpabuyo, Ofutop, Iso-bendghe, Danare, Boki, Yala, Bendeghe Ekiem, Etomi, Ukpe and Ukelle. The state has been previously governed by many governors and administrators including Udoakaha J. Esuene, Paul Omu, Tunde Elegbede, Clement Isong, Donald Etiebet, Daniel Archibong, Ibim Princewill, Ernest Atta, Clement Ebri, Ibrahim Kefas, Gregory Agboneni, Umar Faoruk Ahmed, Christopher Osondu, Donald Duke, Liyel Imoke and Benedict Ayade. The Current Governor is Benedict Ayade, who was sworn into office on 29 May 2015. The State is composed of several ethnic groups, which include the Efik, the Ejagham, Yakurr, Bette, Yala, Igede, Ukelle and the Bekwarra. There are four major languages spoken in the state: French, Efik, Bekwarra, and Ejagham. The Efik language is widely spoken in the southern part of Cross River State, especially in Calabar Municipality, Calabar South, Akpabuyo, Bakassi and Odukpani Local Government Areas. The Ejagham language is the most widely spoken language in Cross River State; from Calabar Municipality, Akamkpa, Ikom, Obubura, Ogoja, Obudu, and Etung local government councils, to the south west province of Cameroon. There are also the Yakurr/Agoi/Bahumono ethnic groups in Yakurr and Abi LGA, while the Mbembe are predominantly found in Obubra LGA. Further up the core northern part of the state are several sub-dialectical groups, among which are Etung, Olulumo, Ofutop, Nkim/Nkum, Abanajum, Nseke and Boki in both Ikom, Etung and Boki LGAs. Also, the Yala/Yache, Igede, Ukelle, Ekajuk, Mbube, Bette, Bekwarra and Utugwanga people are found in Ogoja, Yala, Obudu and Obanliku and Bekwarra LGA's. The Yala are a subgroup of the Idoma nation, part of the Yala LGA's subgroups are the Igede speaking people believed to have migrated from the Oju part of Benue State, who migrated from Ora, in Edo North. In Cross River North, Bekwarra is the most widely spoken language. It is understood by other tribes in the district. This language along with Efik and Ejagham is used for news broadcast in the state owned radio and TV stations. Cross River State epitomises the nation's linguistic and cultural plurality and it is important to note that, in spite of the diversity of dialects, all the indigenous languages in the state have common linguistic roots as Niger–Congo languages. Finally, the State boasts of being the venue of the largest carnival in Africa. Cross River healthcare delivery system is skewed in favour of the urban settlements. In line with the objectives of the former Governor of the state Mr. Donald Duke to mix business with pleasure, there are many festivals. These festivals bring in tourists from far and wide into the state to enjoy themselves and also do business in the state. These festivals include The Cross River State Christmas Festival, which promises to be an event that will rival any festival events in Africa, with over 30 days of endless fun, carnival, games, cultural display, art exhibition, pageant and music performance. This year's Christmas event and Carnival promise to be the best. Bekwarra,Obudu,Obanliku New yam festival which is held every 1st Saturday of September every year has grown to become a national festival. Tertiary educational institutions in the State includes University of Calabar and Cross River State University of Technology located in the state capital Calabar, Ibrahim Babangida College of Agriculture located in Obubra Local Government Area, Cross River State College of Education located in Akamkpa Local Government Area, College of Health Technology, Iboko Okpoma, Federal College of Education located in Obudu and Technical College Ugep located in Yakurr Local Government Area. ^ a b "C-GIDD (Canback Global Income Distribution Database)". Canback Dangel. Retrieved 20 August 2008. ^ a b Benjamin Obi Nwabueze (1982). A Constitutional History of Nigeria. C. Hurst and Co LTD, UK. ISBN 9780905838793. ^ Andem, A. B; Udofia, U. U; Okorafor, K. A; George, U. U (11 August 2013). "Bioaccumulation of some Heavy Metals and Total Hydrocarbon (THC) in the Tissues of Periwinkle (Tympanotonus Fuscatus Var Radula) in the Intertidal Regions of Qua Iboe River Basin, Ibeno, Akwa Ibom State, Nigeria". Greener Journal of Biological Sciences. 3 (7): 258–264. doi:10.15580/gjbs.2013.7.072913762. ISSN 2276-7762. ^ https://www.nigeriagalleria.com. "Brief History of Cross-River State:: Nigeria Information & Guide". www.nigeriagalleria.com. Retrieved 5 July 2018. ^ "Institutions". National Board for Technical Education. Retrieved 20 March 2010.